In asking, “who is listening?” you are at first conscious of the question as well as the sound. When the questioning penetrates deeper, you cease to be aware of it. So when a bell rings it is only the bell listening to the sound of the bell. Or to put it another way, it is the sound of yourself ringing. From: Kapleau, P. (1965) The Three Pillars of Zen. 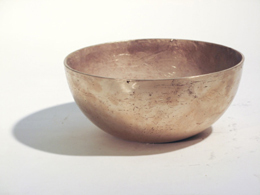 In many Oriental cultures, the bowl is not simply a symbol or signifier of nourishment in terms of foodstuffs but also references the monastic tradition. 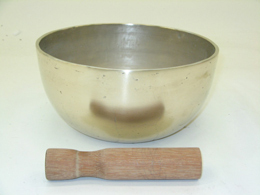 The bowl is the receptacle, which monks use to receive alms of food and money and is an instrument for assisting meditation and making relaxing music. 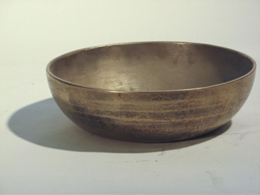 Each of these cast, bell-bronze, bowls produces a unique sound; even when the cast patterns appear to be duplicates, their physical mass and tonal properties differ distinctly. McPeake’s work often directly references sonic elements in order to generate a wider vocabulary for reading. What lies outside of, or beyond the direct framing of the work can provoke the imagination and in this case to consider the nature of the many possible cacophonies. The artist would like to acknowledge the generous support of Chelsea Arts Club Trust.